Laura Jean Allen (1916-2003) studied at the Pennsylvania Museum School in Philadelphia and graduated in 1939. 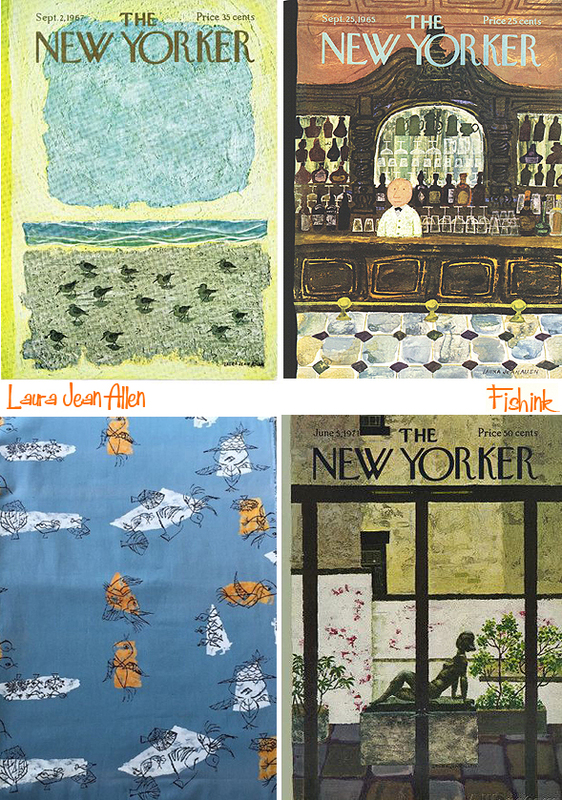 According to Art for Every Home: An Illustrated Index of Associated American Artists Prints, Ceramics, and Textile Designs (Mariana Kistler Beach Museum of Art, 2016), she was ‘one of the most prolific of the Associated American Artists ‘. 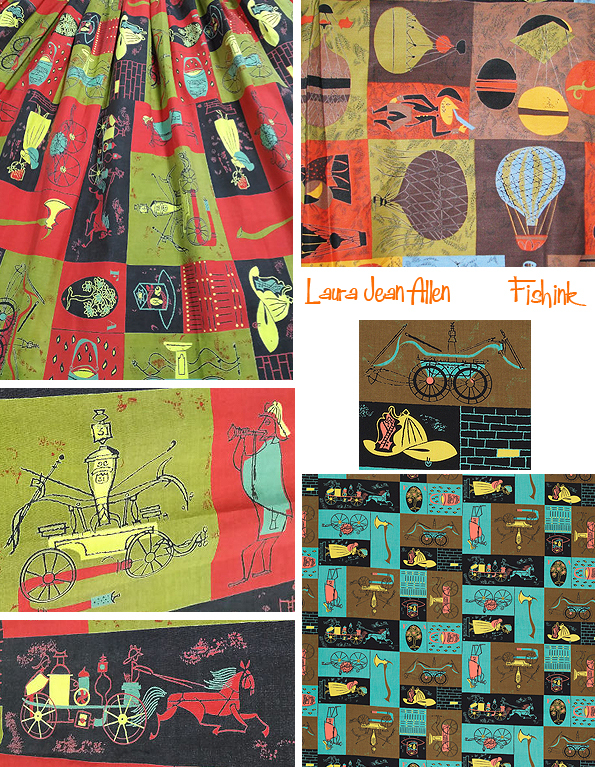 Products featuring her art included Stonelain ceramics as well as textiles produced by Riverdale Fabrics and by M. Lowenstein & Sons for the Signature Fabrics series. 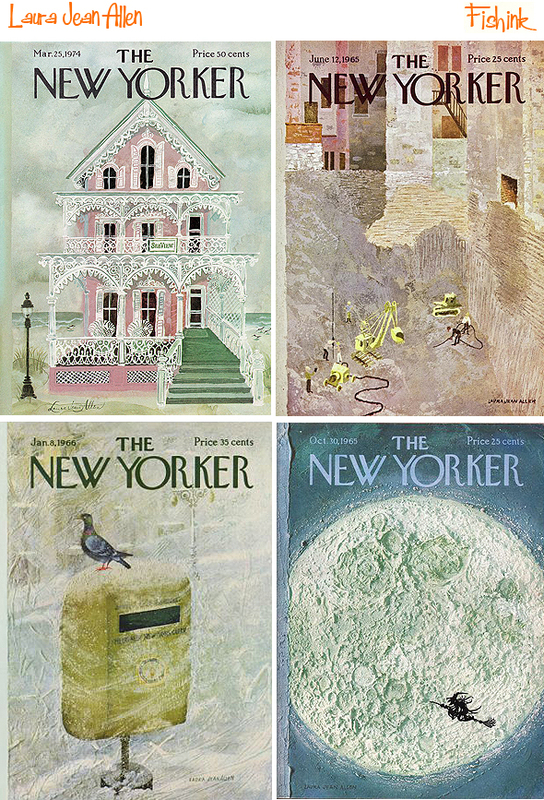 Her textile designs were featured widely from 1952-1956 in Vogue and Vogue Pattern Book, Simplicity Patterns, Women’s Wear Daily, Harper’s Bazaar, Mademoiselle, and Seventeen. 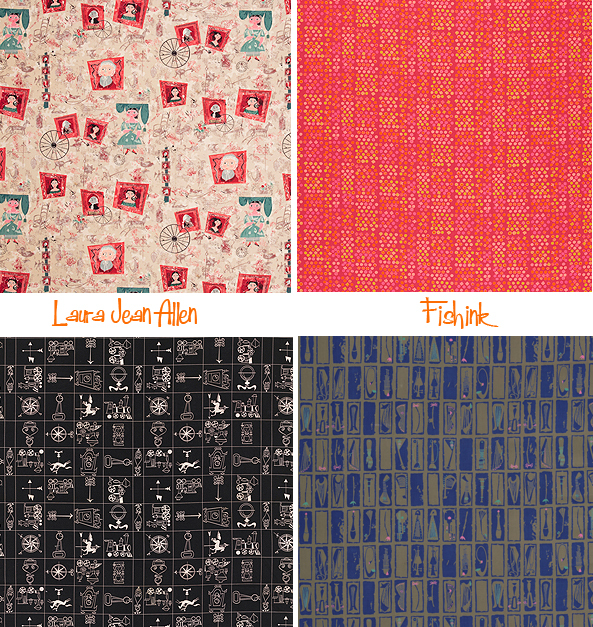 Her designs are included in the collections of the Metropolitan Museum of Art, the Museum at the Fashion Institute of Technology, and the Helen Louise Allen Textile Collection of the University of Wisconsin, Madison. 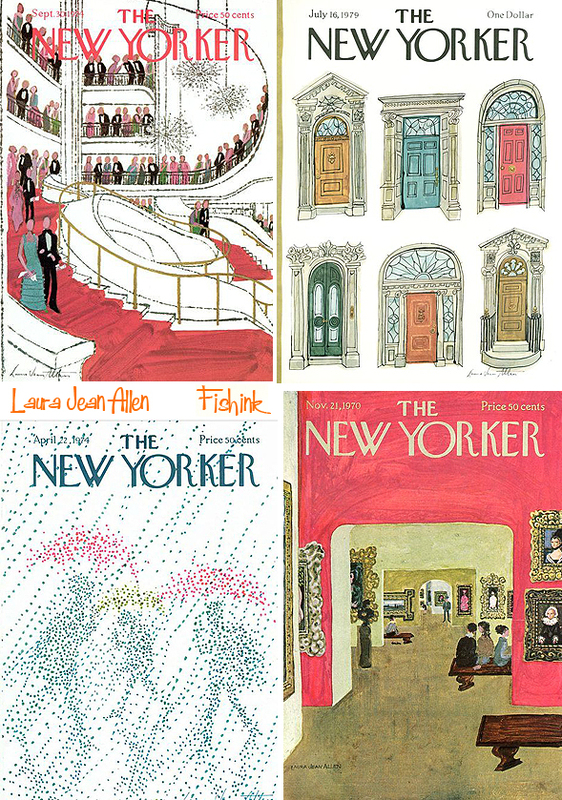 Laura’s artwork appeared on 16 covers of The New Yorker from the 1960s through the 1980s. What a fabulous range of styles she has here. From textures and fine line work to paintings and collages. 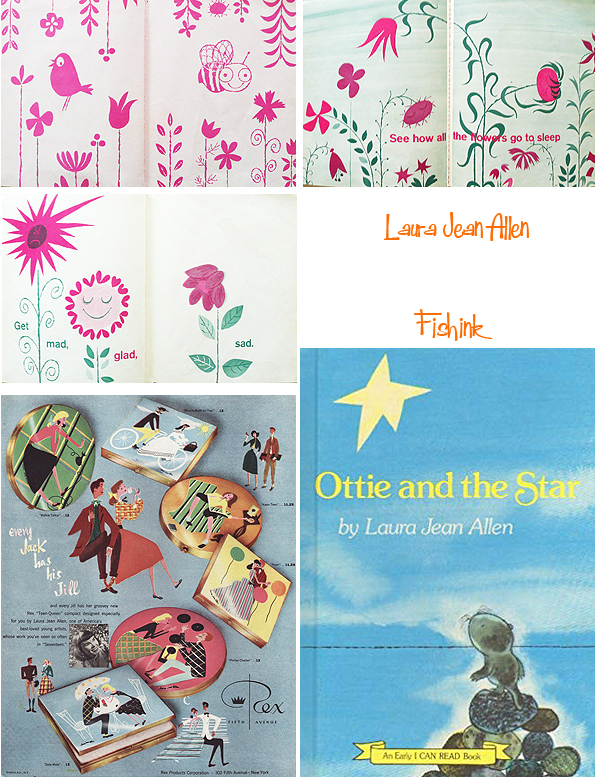 She also wrote and illustrated several children’s books, including A Fresh Look at Flowers (Franklin Watts, Inc., 1963), Ottie and the Star (Harper & Row, 1979), Where is Freddy? (Harper & Row, 1986), and the Rollo and Tweedy books (HarperCollins). 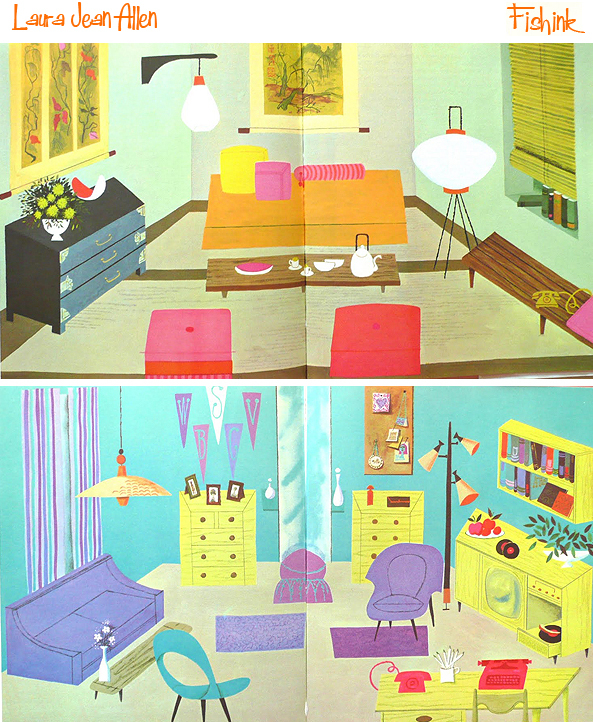 Her illustrations appear in Mary Furlong Moore’s Your Own Room: The Interior Decorating Guide for Girls (Grosset & Dunlap, 1960). 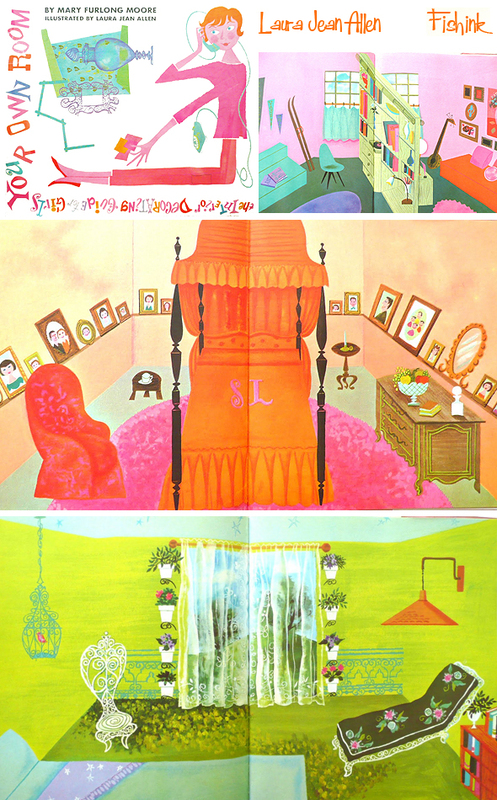 She also created Mr. Jolly’s Sidewalk Market (Holt, Rinehart and Winston, 1965). I think her style here is very similar to another favourite of mine Michel Sasek. 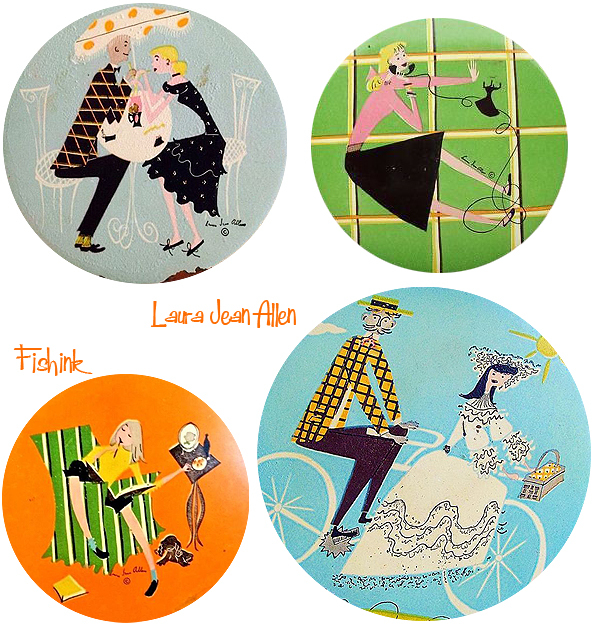 I came across some designs for pin badges or perhaps compact cases. Here’s a rare image of Laura in the midst of sorting through her textile designs and another of her books The Secret Christmas. 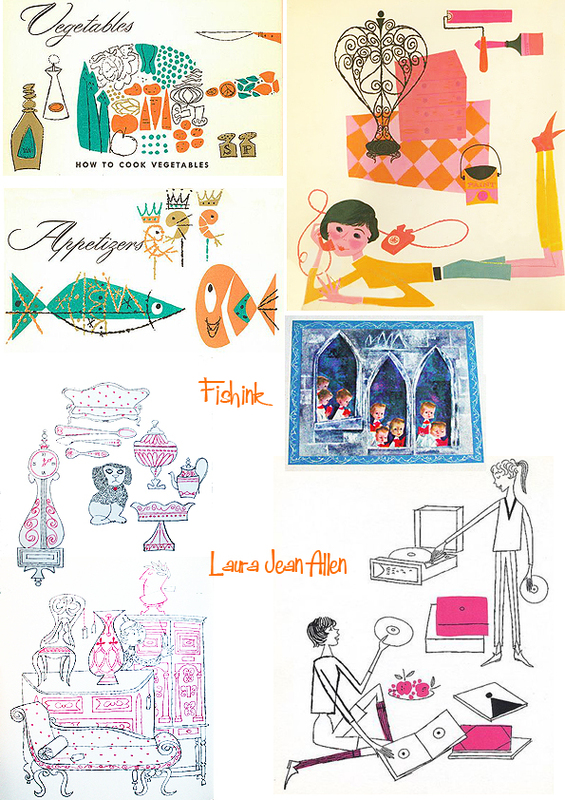 Fine line illustrations for cookery books, cards and advertising. 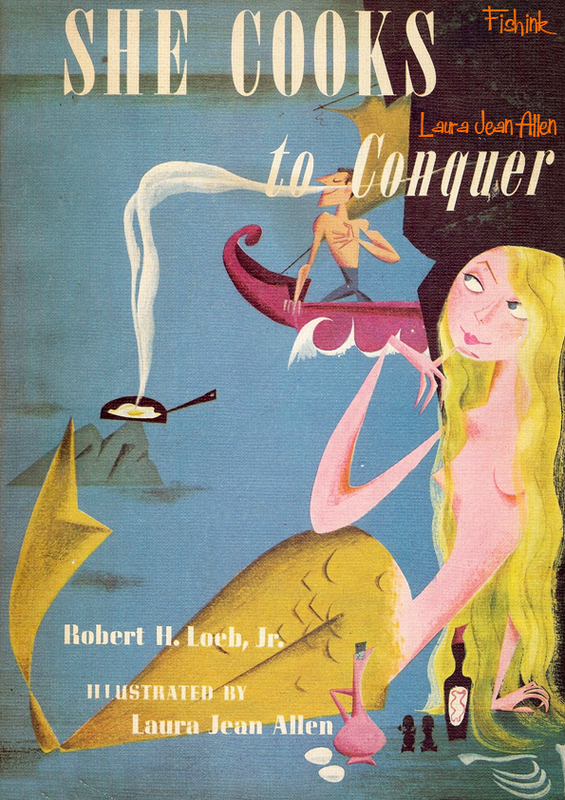 This final one is a wonderful twist on She Stoops To Conquer… what an amazing cover for a cookbook! Many thanks to Cooper Hewitt for the information on Laura used today and to Colin West for bringing Laura to my attention. Interesting lady. I’d love to have one of those compacts.